Beer we go again – Wrexham Real Ale Trail returns 13thApril. This celebration of the Welsh pubs is for persons 24 or over. Real Ale Trails was created seven years ago in North Wales to help save village pubs from closure. The devastating effect of the smoking ban and cheap supermarket prices made running a rural pub nearly impossible, hence the closing of hundreds of pubs across the UK. The Real Ale Trail was born out of the need to introduce new people to venues to eat and drink with resounding success and now you can find other trails in Snowdonia, Arfon, Wrexham, Conwy, Wirral and Flintshire. One of the perks of living in Wrexham is that you get your very own Real Ale Trail on Saturday April 13th that is solely dedicated to driving ale lovers to 7 of the best rural country pubs giving people the opportunity to sample some tasty Welsh beer without having to worry who’s going to do the driving. No designated drivers needed here for this jolly. Wrexham is fiercely proud of its pub and it’s a county full to the brim with some of the best real ale drinker could wish for. But sampling those pubs – and most importantly, that ale – presents your average real ale fan with one major problem: who’s going to do the driving? The Real Ale Trail gives drinkers the opportunity to sample up to 7 fantastic pubs between 12 noon and 10pm in one day without having to worry who’s going to ferry them between hostelries – and we are thrilled to confirm, and after proving a huge hit over the years we the trail is strong and we are heading for 7 of the following pubs. With one pub in town and six country pubs to visit on the day, the buses arrive to pick up every 30 minutes from 12 noon to 10pm all for £15.00 ticket to ride. “Two of the hostelries are putting on mini real ale festivals, there is also live music and plenty of delicious home cooked to soak up the ale. The idea is so trailers can see what ales the pubs have throughout the year with the idea they will come back off their own steam another time”. Says organiser Siwan Jones. “My friends and I often visit cities to do our own ale trail because getting to each pub is without hassle. So this idea was right up our street it’s a great idea and a great way for me to visit country pubs and their take on ale”. said Guto Williams from Penrhyn Bay. More then 1000 local people take took part in last year’s festivals, mostly local people but lots coming from all over from England to come and visit Wrexham for the weekend. 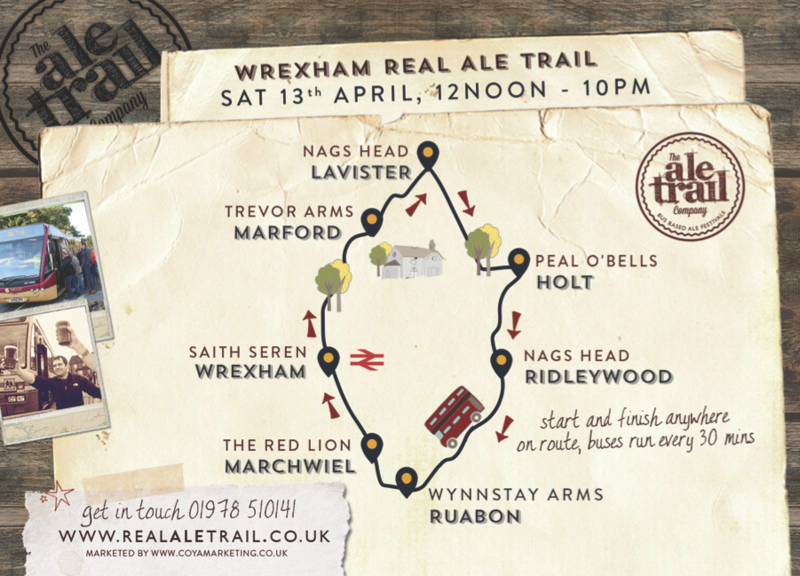 The Wrexham Real Ale Trail takes place on Saturday, April 13th. You can buy a ticket online for £15 in advance at www.realaletrail.co.uk or for £18 on the day. Please don’t buy from anywhere else though, as your ticket won’t be accepted on the bus. “There’s a lot to be explored here in Wrexham” says Peter Lane from the Holts Peal O’ Bells “The amount of local ales we all stock on the trail is second to none, and is probably the only time you will get to witness this kind of selection as a lot of ales are small batch brewed for the day of the trail”. Your ticket allows you and your friends to hop on and off the Real Ale Trail shuttle buses between noon and 10pm on April 13. Buses aim to arrive every 30 minutes at each pub and you can start and finish anywhere on the route. What’s not to love? We’ll see you there.